Marketing Coordinator develops and implements various marketing and advertising strategies to market the company products. 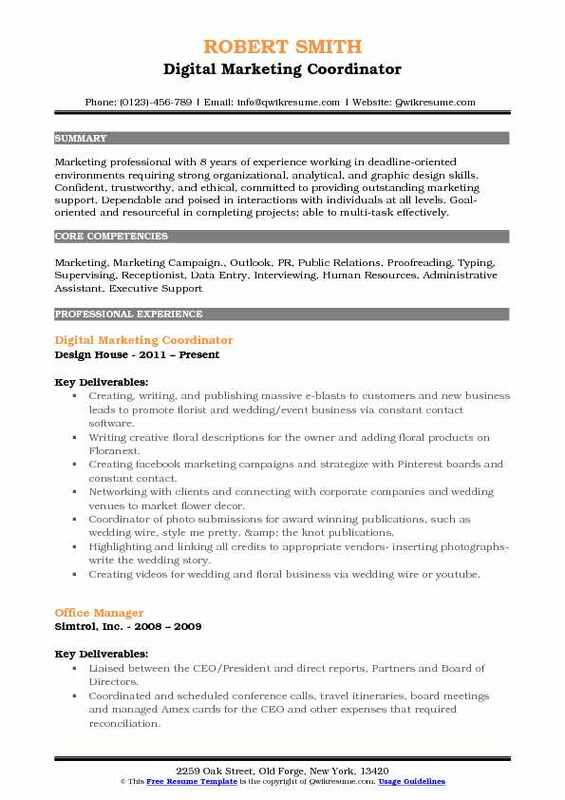 Based on Marketing Coordinator Resume sample a marketing coordinator is expected to get involved in various job responsibilities such as tracking sales details, planning meetings, organizing trade shows, maintaining databases, preparing reports and arranging promotional items ready. The marketing coordinator is also expected to support the staffs and provide the information with regards to market trends, forecasts, new product awareness, sales data, and account analyses. 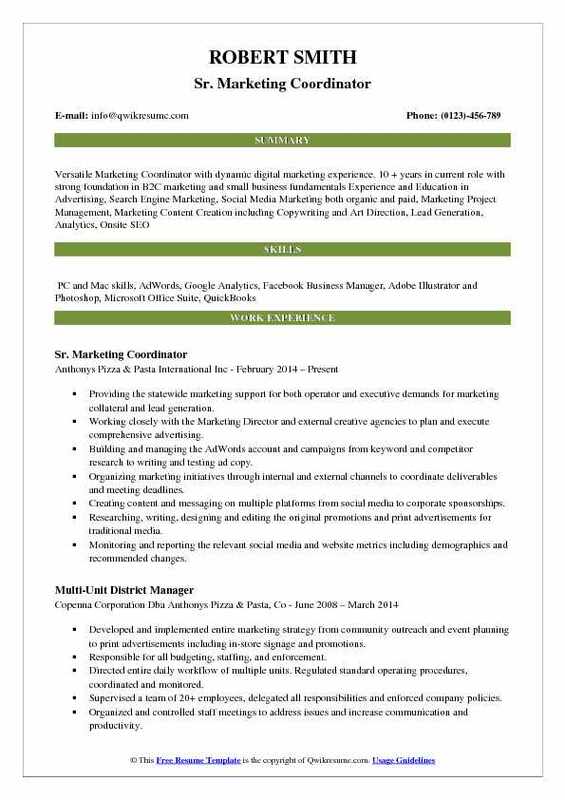 The best Marketing Coordinator resume demonstrates analytical, communicative and interpersonal skill, having the flexibility to work in a team is also a plus point. 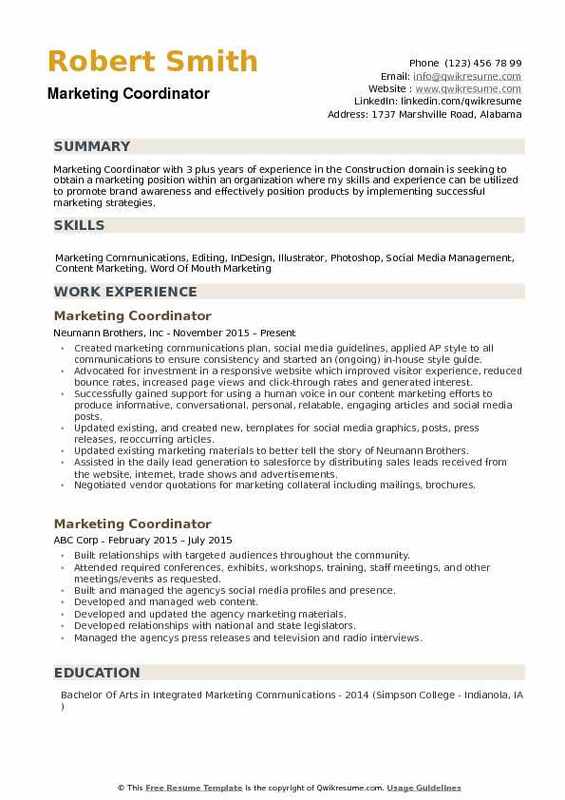 Typically marketing coordinator job position needs an associate degree, but a Bachelor’s degree coupled with work experience helps to attain a specialist role. Summary : Skilled Marketing Coordinator with 18 years of experience in the Law domain, experienced in making continuous improvements in daily operations by adding efficiency and value through effective communication, organization and overall project management. Distributed attorney-authored e-advisories, alerting clients to current legal issues, and repurposed the articles for publication in related periodicals. Prepared all collateral and presentation/seminar materials to provide added value for client. Organized all aspects of client receptions to provide networking opportunities, facilitating new partnerships. Developed and implemented firm marketing strategies, objectives, and programs in alignment with the firms brand. Managed and updated firm website, social media, attorney biographies, national and international legal directories and intranet. Designed and placed numerous firm advertisements, both in print and digital. Created, produced and distributed marketing collateral including e-alerts, newsletters, annual reviews. Organized all aspects of firm event and marketing seminars, executive forums and client receptions. Coordinated all aspects of firm participation in sponsorships, trade shows and business expositions to most. Coordinated and implemented marketing activities related to the opening of multiple firm locations including announcements, client receptions, updated stationery and other printed material. 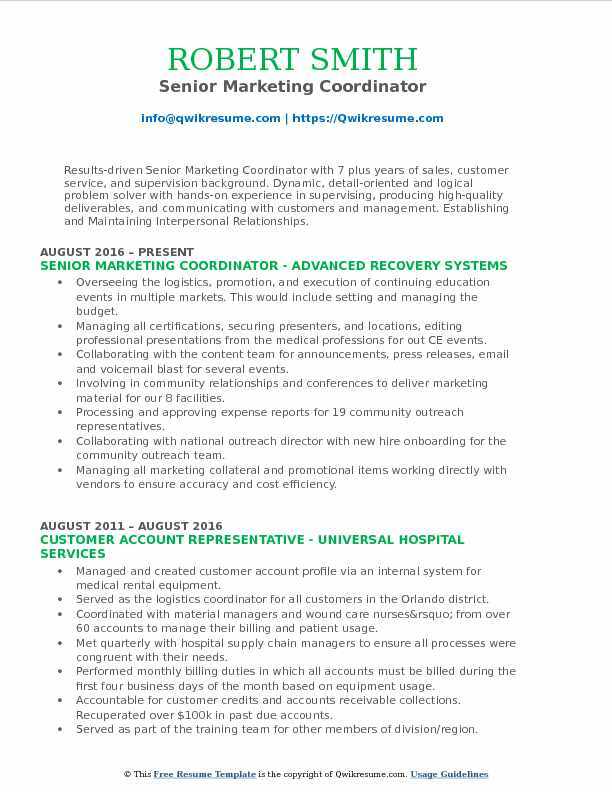 Summary : Dynamic Marketing Coordinator with over eleven years of experience in the Manufacturing and Media domains. Experience developing and implementing all aspects of corporate branding including digital and print advertising, e-commerce, email promotions and content writing. Implemented all pre-to-post marketing activities and materials including print and digital advertisements, booth layouts, e-mail campaigns, promotions, and graphics. Managed vendors project target dates for graphics creation including signage and displays while abiding by company style guide requirements. Supervised all vendors and contractors trade show deadlines to ensure successful execution of logistics, freight, booth storage, electrical, rigging and bill of lading. Processed and forwarded trade show leads to the sales team and sales administrators for follow-up and quote generation using SAP and MS Outlook. Increased 4Q 16 service and parts orders by 3% due to positive responses from direct mail campaign initiatives. Provided daily troubleshooting support during website chats regarding inquiries for sales. Played a key role in creating marketing collateral for promoting new and existing products and services including digital and print advertising, direct mail, social media and email marketing. Managed and reviewed marketing budget with sales force and management for over ten annual corporate trade shows and seasonal events. Met with management and sales team in the planning and design of annual trade show. Providing the statewide marketing support for both operator and executive demands for marketing collateral and lead generation. Working closely with the Marketing Director and external creative agencies to plan and execute comprehensive advertising. Building and managing the AdWords account and campaigns from keyword and competitor research to writing and testing ad copy. Organizing marketing initiatives through internal and external channels to coordinate deliverables and meeting deadlines. Creating content and messaging on multiple platforms from social media to corporate sponsorships. Researching, writing, designing and editing the original promotions and print advertisements for traditional media. Monitoring and reporting the relevant social media and website metrics including demographics and recommended changes. Mediating all inquiries, questions and complaints on all social media channels and all corporate email accounts. Initiating, developing and executing community outreach events with experience in onsite management. Facilitating statewide operations through menu development, regulation, enforcement and new product testing/launch. Researching and implementing the innovative hiring methods and new ways to attract potential employees. 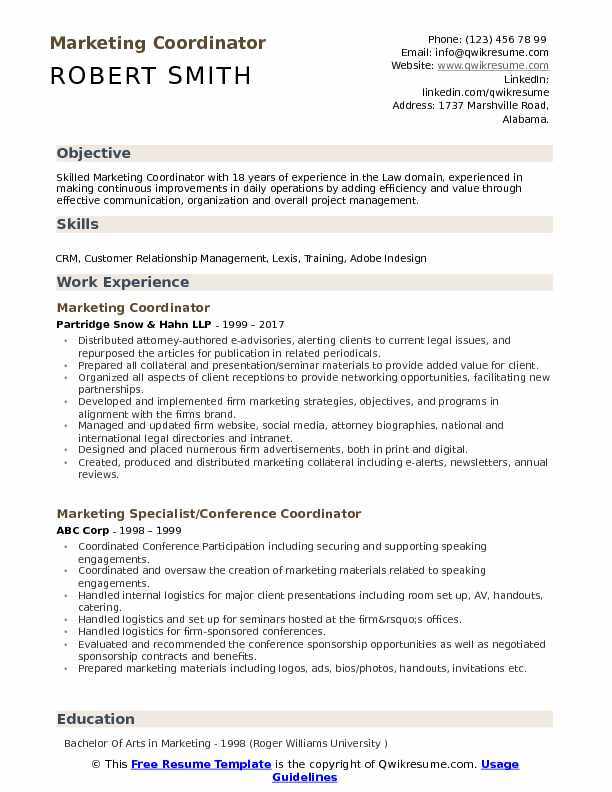 Objective : Marketing Coordinator with 2 plus years of experience in the Finance domain is seeking to obtain a career within the office administration and customer service fields that will challenge me and allow for utilization of my skills, past experience and education, in a way that is mutually beneficial to both myself and my employer to allow for future growth and development. Coordinating projects and activities for marketing products and services. Coordinating the creation and production of sales, marketing, and packaging materials. Reviewing specification sheets, obtaining and preparing bids, and acting as liaison with vendors in such areas as delivering marketing material, scheduling proofs, and meetings. Maintaining customer database and generating internal database information, such as lists and counts for direct marketing projects. Maintaining inventory of photo work, artwork, and film, and maintaining marketing literature, archive files, and sample files. Coordinating trade show exhibits, promotions, packaging, shipping, and staff travel plans, and traveling to and participating in trade shows when necessary. Developing and maintaining websites, newsletters, emails, social media campaigns. Identifying and proposing internal/external ideas and initiatives to help promote general awareness of company brand. Welcoming visitors by greeting them, in person or on the telephone and answering or referring inquiries. Performing other clerical receptionist duties such as filing, photocopying, mailing and faxing. Submitting expenses and keeping updated records of office expenses and costs. 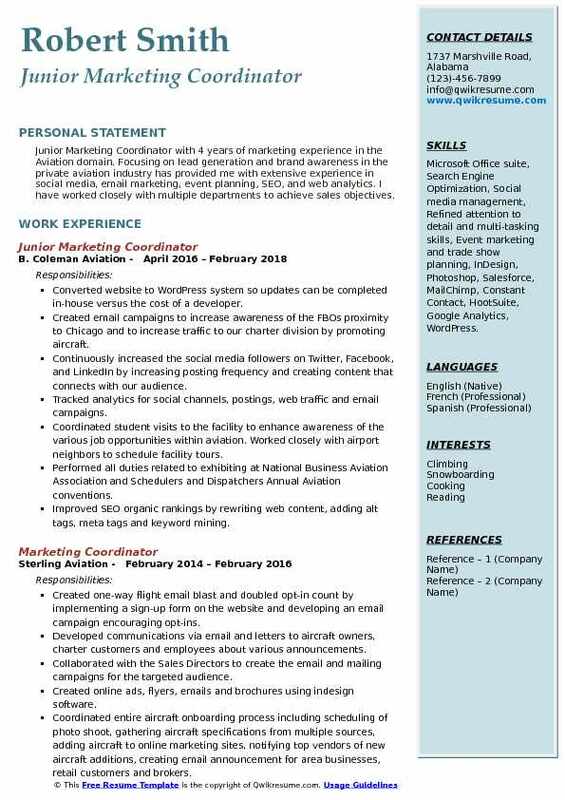 Objective : Junior Marketing Coordinator with 4 years of marketing experience in the Aviation domain. Focusing on lead generation and brand awareness in the private aviation industry has provided me with extensive experience in social media, email marketing, event planning, SEO, and web analytics. I have worked closely with multiple departments to achieve sales objectives. 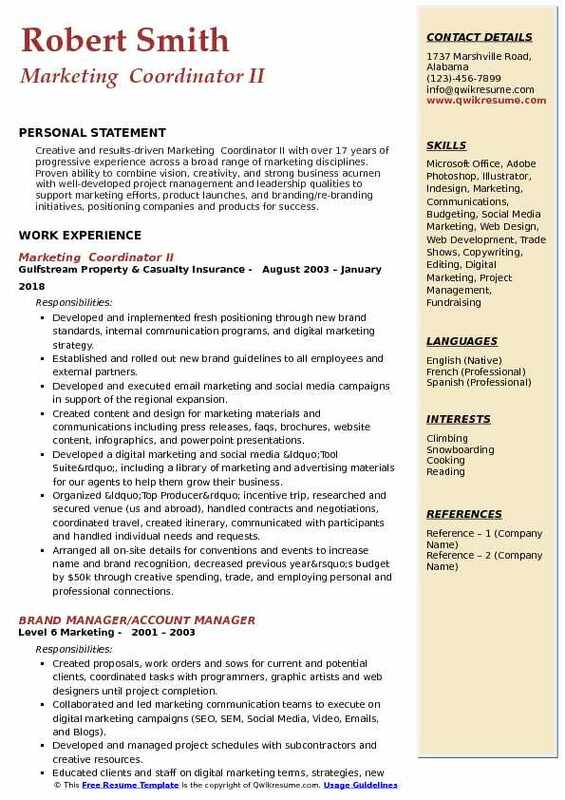 Skills : Microsoft Office suite, Search Engine Optimization, Social media management, Refined attention to detail and multi-tasking skills, Event marketing and trade show planning, InDesign, Photoshop, Salesforce, MailChimp, Constant Contact, HootSuite, Google Analytics, WordPress. Converted website to WordPress system so updates can be completed in-house versus the cost of a developer. Created email campaigns to increase awareness of the FBOs proximity to Chicago and to increase traffic to our charter division by promoting aircraft. Continuously increased the social media followers on Twitter, Facebook, and LinkedIn by increasing posting frequency and creating content that connects with our audience. Tracked analytics for social channels, postings, web traffic and email campaigns. Coordinated student visits to the facility to enhance awareness of the various job opportunities within aviation. Worked closely with airport neighbors to schedule facility tours. Performed all duties related to exhibiting at National Business Aviation Association and Schedulers and Dispatchers Annual Aviation conventions. Improved SEO organic rankings by rewriting web content, adding alt tags, meta tags and keyword mining. Created image library for marketing purposes by scheduling and directing photo shoots for charter aircraft, FBO services, and management team profile photos. Designed online and print ads, one sheet, social images, and web images using indesign software. Wrote communications for email and letters to FBO and charter customers, potential clients and industry professionals about various announcements. Summary : Outgoing marketing and technical writing specialist with an MBA and 13 years of experience in business development and consulting. 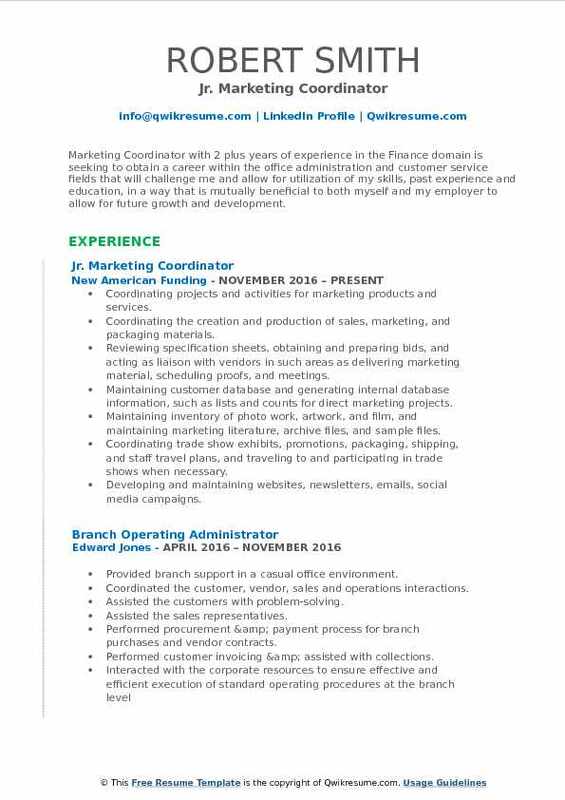 Seeking to leverage technical and professional office expertise and to grow into a new position. Provided marketing support to HDR co-marketers and technical staff locally and across the U.S. In the waste, mining, oil and gas, power, industrial, and federal business divisions. Conceptualized, researched, and produced marketing documents: proposals (5-250 pages in response for thousands to multimillion-dollar projects), promotions, brochures, flysheets, and presentations for Alaskan clients including state departments and municipalities, federal agencies, native corporations, and private clients. Multi-tasked and worked with diverse teams of subconsultants and marketing and technical staff to keep proposal development on track and met deadlines. Produced marketing documents with professional accuracy, consistent and clear communication, and timely turn-around. Wrote technical and marketing text, and edited and proofread all marketing communications. Assisted technical staff in providing capture planning efforts for projects and client relationship development. Spent 50% of the time in assisting technical staff in pre-marketing activities to win work and obtain sole source work from clients. Provided storyboarding and messaging development for strategic pursuits. Coordinated trade show participation and developed conference concepts, promotions, artwork, and coordinated booth activities. Kept accurate and up-to-date records for fee tracking in CRM system of upcoming work for current and future years for all environmental, energy, federal, and oil and gas project work in Alaska. 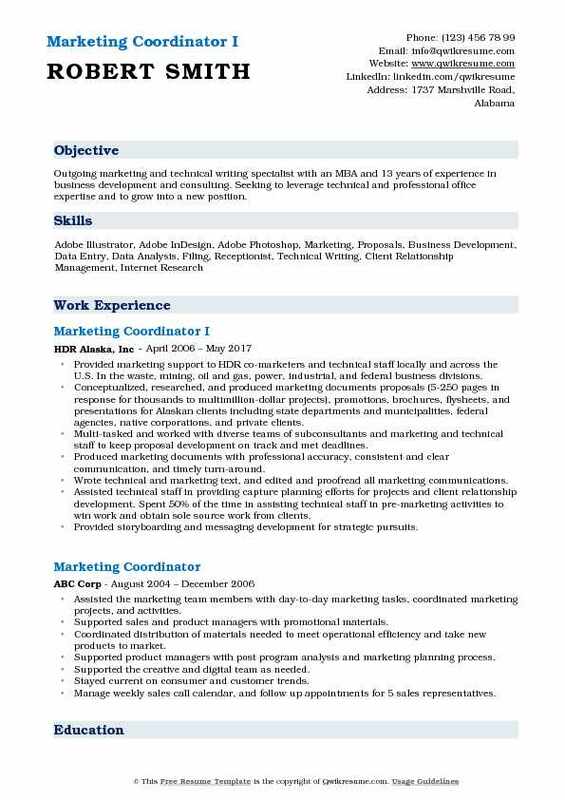 Summary : Results-driven Senior Marketing Coordinator with 7 plus years of sales, customer service, and supervision background. Dynamic, detail-oriented and logical problem solver with hands-on experience in supervising, producing high-quality deliverables, and communicating with customers and management. Establishing and Maintaining Interpersonal Relationships. Skills : Training, Billing, Account Management, And Account, Excellent Communication. Overseeing the logistics, promotion, and execution of continuing education events in multiple markets. This would include setting and managing the budget. Managing all certifications, securing presenters, and locations, editing professional presentations from the medical professions for out CE events. Collaborating with the content team for announcements, press releases, email and voicemail blast for several events. Involving in community relationships and conferences to deliver marketing material for our 8 facilities. Processing and approving expense reports for 19 community outreach representatives. Collaborating with national outreach director with new hire onboarding for the community outreach team. Managing all marketing collateral and promotional items working directly with vendors to ensure accuracy and cost efficiency. Managing all conference arrangements for business development representatives in several states. This includes an application for the level of sponsorship, collaborating with AP for payment, travel, shipping all necessary materials, working with event coordinators to ensure all our BD reps needs are met. Managing any concerns with building owners to ensure all aspects of the call center are in working order. Summary : Marketing professional with 8 years of experience working in deadline-oriented environments requiring strong organizational, analytical, and graphic design skills. Confident, trustworthy, and ethical, committed to providing outstanding marketing support. Dependable and poised in interactions with individuals at all levels. Goal-oriented and resourceful in completing projects; able to multi-task effectively. Creating, writing, and publishing massive e-blasts to customers and new business leads to promote florist and wedding/event business via constant contact software. Writing creative floral descriptions for the owner and adding floral products on Floranext. Creating facebook marketing campaigns and strategize with Pinterest boards and constant contact. Networking with clients and connecting with corporate companies and wedding venues to market flower decor. Coordinator of photo submissions for award winning publications, such as wedding wire, style me pretty, & the knot publications. Highlighting and linking all credits to appropriate vendors- inserting photographs-write the wedding story. Creating videos for wedding and floral business via wedding wire or youtube. Occasional assistance with bridal shows or wedding ceremony/reception setups at venues. Led and won the 2012 and 2015, & 2016 best of Gwinnett, best place to buy flowers marketing campaign. Executed entire voting process. Summary : Creative and results-driven Marketing Coordinator II with over 17 years of progressive experience across a broad range of marketing disciplines. Proven ability to combine vision, creativity, and strong business acumen with well-developed project management and leadership qualities to support marketing efforts, product launches, and branding/re-branding initiatives, positioning companies and products for success. Developed and implemented fresh positioning through new brand standards, internal communication programs, and digital marketing strategy. Established and rolled out new brand guidelines to all employees and external partners. Developed and executed email marketing and social media campaigns in support of the regional expansion. Created content and design for marketing materials and communications including press releases, faqs, brochures, website content, infographics, and powerpoint presentations. Developed a digital marketing and social media “Tool Suite”, including a library of marketing and advertising materials for our agents to help them grow their business. Organized “Top Producer” incentive trip, researched and secured venue (us and abroad), handled contracts and negotiations, coordinated travel, created itinerary, communicated with participants and handled individual needs and requests. Arranged all on-site details for conventions and events to increase name and brand recognition, decreased previous year’s budget by $50k through creative spending, trade, and employing personal and professional connections. Decreased marketing communications expenses by 20% through utilization of graphic design skills and cultivated vendor relationships. 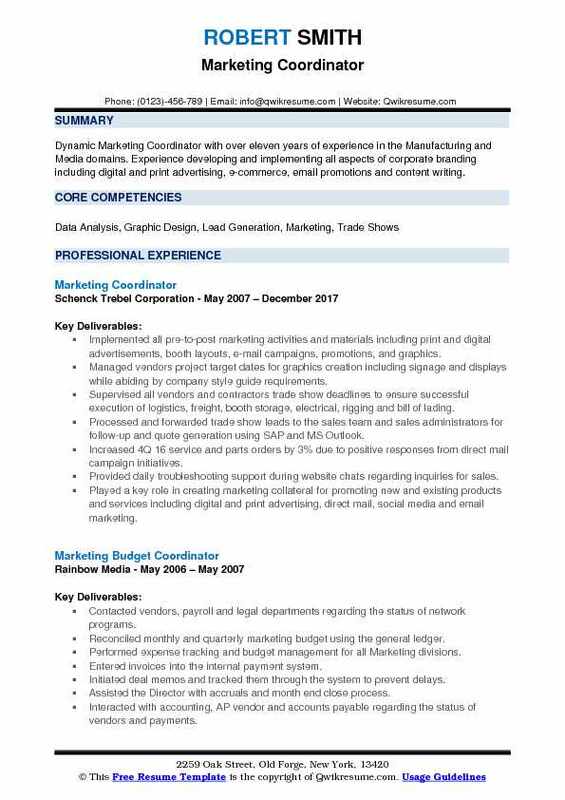 Objective : Marketing Coordinator with 3 plus years of experience in the Construction domain is seeking to obtain a marketing position within an organization where my skills and experience can be utilized to promote brand awareness and effectively position products by implementing successful marketing strategies. Created marketing communications plan, social media guidelines, applied AP style to all communications to ensure consistency and started an (ongoing) in-house style guide. Advocated for investment in a responsive website which improved visitor experience, reduced bounce rates, increased page views and click-through rates and generated interest. Successfully gained support for using a human voice in our content marketing efforts to produce informative, conversational, personal, relatable, engaging articles and social media posts. Updated existing, and created new, templates for social media graphics, posts, press releases, reoccurring articles. Updated existing marketing materials to better tell the story of Neumann Brothers. Assisted in the daily lead generation to salesforce by distributing sales leads received from the website, internet, trade shows and advertisements. Negotiated vendor quotations for marketing collateral including mailings, brochures. Provided support to high-level managers through the development of the annual resources strategic plan booking and client development goals.